Born and trained in the capitol of the Austro-Hungarian Empire, Richard Neutra spent the majority of his career in California, where his rigorously geometric, light-filled structures are celebrated as the epitome of the West Coast expression of modernist architecture. Neutra studied with Adolf Loos, one of the principal early theorists of modern architecture, at the Vienna University of Technology from 1910 to 1918. After World War I, he worked for landscape architect Gustav Ammann in Switzerland, before serving as city architect of the German town of Luckenwalde. In 1921, he joined the architecture office of Erich Mendelsohn in Berlin. 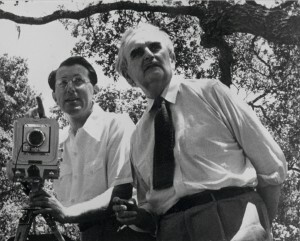 Neutra moved to the United States in 1923 and became a naturalized citizen in 1929. He worked briefly for Frank Lloyd Wright before accepting an invitation from his close friend and university companion Rudolf Schindler to work and live communally in Schindler’s Kings Road House in California. Neutra’s first work in Los Angeles was in landscape architecture, where he provided the design for the garden of Schindler’s beach house. In 1927, Schindler and Neutra formed a firm with the planner Carol Aronovici called the Architectural Group forIndustry and Commerce (AGIC). Neutra formed his own practice in Los Angeles and went on to design numerous buildings, twelve of which are designated as Historic Cultural Monuments. In California, his interpretation of the midcentury modern residence attracted many notable clients, including Edgar J. Kaufmann and Walter Conrad Arensberg. In 1932, Neutra was included in the seminal MoMA exhibition on modern architecture, International Style, curated by Philip Johnson and Henry-Russell Hitchcock. Neutra contributed four designs to the famed Case Study House Program. Throughout his career, Neutra designed many dozens of residences in Southern California, including approximately ten homes on the Palos Verdes Peninsula, beginning with the residence of Mildred and Dr. Grant Beckstrand, built in 1940. In 1949 Neutra formed a partnership with Robert E. Alexander that lasted until 1958, and included the design of commercial and institutional buildings. In 1955, the United States Department of State commissioned Neutra to design a new embassy in Karachi, part of a program commissioning prominent architects including Walter Gropius, Marcel Breuer and Eero Saarinen. In 1965 Neutra formed a partnership with his son Dion Neutra, who today manages the Neutra Institute for Survival Through Design.